Leigh is a Underwood personal trainer. Leigh has been involved in sports as far back as she can remember. She has always enjoyed the feeling you get from being active - running, jumping, kicking, throwing, any type of physical exertion. Leigh bring a background in playing Soccer, American Basketball and long distance running. After becoming a "gym junkie" at the age of 46, Leigh decided to complete her qualifications in the fitness industry. With over 40 years of sports and activities experience, as well as life long experience with female issues, Leigh is excited about helping other women attain the benefits of a healthy and active lifestyle. My style of training is quality over quantity with an emphasis on technique. Listening to the clients and delivering a program that fits into their lifestyle and goals. You like to be challenged. You need motivation and support. You need to take the first step to a fitter and better YOU! Jaclynn is a Underwood personal trainer. Jaclynn has been involved with the health and fitness industry since 2003 getting her first taste of the gym environment as a receptionist at a local gym. From this early exposure to the industry, she new she wanted to become a trainer in the industry inspiring others. Always being involved with sports and yoga, Jaclynn is motivated and helping other achieve their health and fitness goals. Having a personal trainer herself and being a regular gym goer helps push her become a better trainer and person. I like to incorporate cardio and weights into my session to help clients improve heart health and lose weight, while also toning up their bodies. You are looking to improve your fitness levels. You wantt ot lose weight. You want to tone up your body and look and feel good. Ash is a Underwood personal trainer. Ash has been involved in sports her entire life. She played volleyball at an international level through school then making the transition to beach volleyball. After she was forced out of the sports by an injury, she focused on rehabilitating and building her fitness up again. She incorporates many different styles of training based on her experiences to suit her clients needs. Her vast array of experience can help her many types of clients, whether it is recovering from an injury to become and elite fitness or sport athlete. She is always striving to push her clients and help them achieve their very best. As an elite athlete you are exposed to a range of the very best training and coaching techniques. I incorporate many of these techniques in my training to help fast-track my clients. You like to train to your increase your fitness level. You want to be pushed that little bit further. You want to achieve your goals, no matter what they are. Hayley is a Underwood personal trainer. Hayley has been involved in the fitness industry since she was 15 years old working for her local gym. This is where she started to attain real hands on experience in the fitness industry which slowly lead her to a career. After school, she went straight into study at MAX and began working as a personal trainer. Since then she has worked at a few gyms continuing to expand her knowledge and experience. During her studies, she also completed a boxing and kickboxing as well as a coaching certification through the AIS (Australian Institute of Sports). I'm a big fan of incorporating boxing techniques into training while super setting these with weights and cardio. I believe it gives incredible results to ultimate strength. Boxing is cardio made fun. I love it because you can incorporate it to each person to what they are wanting to achieve. You want to reach your highest potential. You want to find and enjoy the fun in fitness. You want to be the change your looking for. Monica is a Browns Plains personal trainer. 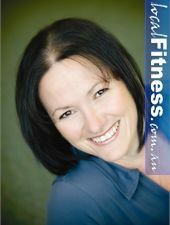 The transition from graphic designer to personal training began for Monica in June 2009. She had worked in the newspaper industry for 15 years and decided it was time to change careers. During Monica’s school years she was involved in gymnastics, swimming, netball, touch football and water polo. She has also been running, doing Yoga, Pilates, weight training and boxing since leaving school. Monica decided to turn these hobbies into something more, and became a member of Fernwood Brown Plains. 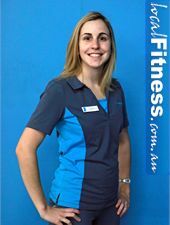 Monica knew that this industry was truly rewarding and exciting so she completed her qualifications in Certificate III and IV In Fitness through Fernwood Learning. Monica was able to complete her work placement at the gym which gave her great experience necessary for the roles of a gym instructor, food coach and finally a Personal Trainer. 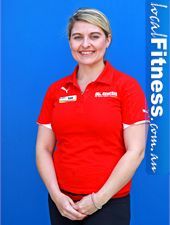 Monica is pleased to be working as a personal trainer at the Browns Plains gym since August 2010 and as a gym instructor, food coach since February 2010. In September 2010, Monica achieved a boxing for fitness level 1 and has completed an instructor course with thump training systems. Now Monica enjoys working with her clients to assist them to achieve their personal goals and motivate them throughout the entire process. My training style focuses on strength and power with the use of plyometrics and compound exercises. These exercises will get your heart rate up as it works a range of muscle groups all at the same time. I personally would like to go for a quick run rather than a long run. I will bring variety to all my sessions in order for clients to feel enthused and eager at each of my sessions. I believe that a 30 minute training session can get a person positive results as it is all about intensity. I have Coeliac Disease and I am lactose intolerant, so over the years I have become increasingly aware of how important nutrition is in our lives. People think that if they start exercising, they do not need to change their eating habits, but the best results are achieved by following a healthy eating plan combined with regular exercise. For weight loss, people need to remember that energy in needs to be less than energy out! Thump Boxing for Fitness Level 1 and Instructor courses. 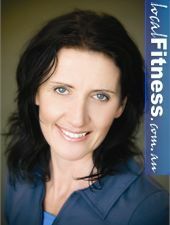 Lahnee is a Chermside personal trainer. Lahnee has been involved in sports since the age of four. During her school years she was involved in every sport possible. In her later years Lahnee competed in District, regional and State Athletics as well as Regional and State level football and soccer. Lahnee is very versatile and due to her experience, enjoys independent and team sports. Lahnee has always tried her hardest and enjoyed exercise and keeping fit her whole life which is why she chose a career in this industry. She wanted to help people love exercise as much as she does and wanted to work with people in achieving their personal fitness goals. Lahnee was eager to complete her qualification so she could start working as soon as possible. Once she completed her fitness training through the Australian Institute of fitness in 2008 she got straight into training others in Fitness. She loves working and seeing people on a daily basis to motivate and assist them in the gym. Lahnee wants to inspire members and clients to be the best they can be. She has arrived to where she is today through hard work and dedication and her desire is to achieve the most out of her life and she feels that her job is truly rewarding when her clients meet their goals and see results. The training style I focus on in my sessions varies as they are individually based. I ensure that my clients' goals are being met while having a suitable program for them. Although my sessions vary, there is a lot of regular fitness tests, cardiovascular endurance and compound strength training to ensure that the workout is going to get the best and most results. I make sure that my sessions are fun and clients are always eager and motivated to give it all their best. Dave is a Lawnton personal trainer. Dave has had an exciting career as an infantry soldier, with deployments to Somalia, Rwanda and East Timor. During his time there he has been in situations where his physical and mental health meant the difference between life and death. Dave felt that his role as a Senior instructor at the ADF was a challenging but also an incredibly rewarding experience. He received many awards, including: Australia Day medal, chief of army commendation and distinguished service medal. Dave was discharged due to a debilitating disease that was affecting his joints, which resulted in him feeling incapable of doing anything. He spent a number of years struggling to deal both mentally and physically due to all his limitations. Dave felt very fortunate and was thrilled to be told a medical solution was available to assist him recover, as he knew that his dreams of fully participating in life again would come true. Dave took it one step at a time to meet his personal goals. This started for Dave when he won a 12 week Body for life challenge which ignited his passion for helping others and his desire to assist his clients overcome whatever obstacles stand in their way to a full, long, healthy life. 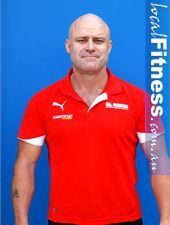 Dave has seen the best and the worst in people the world over, in every situation which means as a personal trainer, he knows there is always a way forward which is why he is so enthusiastic and eager to support clients in the process. My training style focuses on Military background as well as rehabilitation. I have had personal experience in this area which is why I am the best example for my clients. My training involves balance between finding inner strength and self discipline, which engages functional fitness that promotes confidence in life. I will ensure my clients understand the balance of mental and physical barriers that need to be overcome in their journey of good health and fitness. Samantha is a Lawnton personal trainer. Personal training started for Samantha in 2000 when she joined her local gym. She was obsessed with working out and went at least 5-6 days a week. For two years Samantha attended classes at her gym which she thoroughly enjoyed when she realised that this was the industry she would love to work in. Samantha then participated in her first Les Mills training module for body combat while studying part time at Southbank TAFE. Samantha became qualified in BodyPump, BodyStep and cycle and got her first job as a gym and Aerobics instructor. Samantha's next goal was to become a personal trainer in order to work one-on-one with her clients, which she achieved in 2005-2006. From 2006-2009 Samantha felt her employment was a hobby for her and she knew that this industry was definitely her long term career. Samantha currently works full time and she is the personal training coordinator of Genesis Lawnton. She is thrilled by training and changing people's lives everyday. Samantha is very passionate about her work and enjoys working together with her clients to meet their goals in good health and wellbeing. My training style mainly focuses on strength and endurance to help my clients achieve fitness and lean muscle. I specialise in weight loss and healthy lifestyle changes as I have knowledge in the necessary nutrition needs of people. I will ensure that my clients are motivated at all times and they feel that they can rely on me to guide them through their weight-loss journey. Wendy is a Lawnton personal trainer. 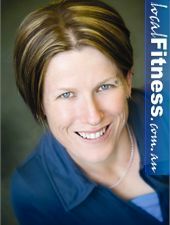 Wendy's goal in the fitness industry is to inspire her clients and give them the knowledge to succeed. Wendy has a background in many sports including athletics, hockey, netball and rugby and she draws her inspirations from personal experiences in weight-loss. After experiencing illness in her life she gained over 25 kilos and at this stage she knew it was time to get back on track with her fitness and health. It was through these experiences and her own weight-loss journey that prompted her to become a personal trainer through the Australian Institute of Fitness in 2009. Wendy now uses her own journey to inspire her clients and understands the challenges faced during weight-loss. Wendy motivates her clients to help them change and maintain a healthy lifestyle through weight-loss challenges and adding variety to her clients' exercise programs. My training style focuses on variation and includes a combination of the skills I have learnt through my fitness experiences. I like to incorporate sporting/training exercises such as endurance, interval, cross plyometric, cross training and various cross fit training style principles. I enjoy mixing up the sessions so my clients get the most effective workout during our time together. Joyce is a Petrie personal trainer. As a child Joyce was always involved with sports including basketball, touch football and long distance running. In 1995 Joyce got back into the fitness industry and at the age of 40, she believed it was time for a career change from a sales rep to the fitness industry. She completed her studies in personal training through the Australian Institute of Personal Trainers. 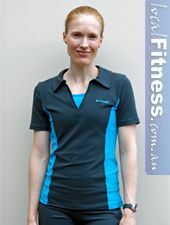 Joyce has been personal training at Fernwood gym since mid 2010 which she thoroughly enjoys. She loves her job and feels that it is truly rewarding. Joyce is eager to assist her clients in the process of reaching their fitness goals. My training style focuses on technique and educating my clients to help them achieve whatever goal they have. I believe that the most important thing is to have fun. I take a positive approach to each of my sessions and I can take people out of their comfort zone. I bring variety to my sessions so my clients are always motivated and eager to train hard. Julie is a Petrie personal trainer. Julie is a mother of three beautiful daughters aged 12, 14 and 16. After the birth of her third daughter, Julie was a stay home mother gaining a lot of weight and was not happy with herself and her lifestyle. It was when her eldest daughter at the time told her she was 'too fat" to get in the pool with them, she knew she had to do something about her weight. Julie joined the gym and hired a personal trainer and even to this day she will never look back. Julie lost 45 kilograms through hard work and commitment. Then through great support from her family she completed certificate III and IV in fitness through the Australian Institute of Fitness. Julie loves everything about personal training and feels her job is truly rewarding. She also teaches boxing, Swissball, Zumba and takes bootcamps. In 2010 Julie joined the simplicity weight management team at Fernwood. My training style is suited to each individual client. I focus on developing a program that will meet their fitness needs and ensure results will be maximised. I bring variety to my sessions so my clients are always motivated to work hard. Celeste is a Petrie personal trainer. Celeste has been in the fitness industry since 2003. As she is a mother, she completed her studies in certificate III and IV part time while raising her children. Celeste was struggling with her weight and she had suffered depression so she joined her local gym to get fit and focus on her health and wellbeing. Celeste was very lucky to be given great support by the wonderful manager of her gym, who quickly became her greatest mentor and helped her complete her course while also helping her get hands on experience. Celeste has a lot of experience training small groups and running boot camps which gives her great skills to motivate her clients in any environment. My training style uses a holistic approach to physical well being. I aim to build self confidence with all my clients and develop a program to suit their needs and fitness goals. While making my clients feel good about themselves I bring variety to my sessions so they are always eager to improve. Most importantly I ensure my sessions are positive and the interaction is motivating so my clients are having fun. Catherine is a Petrie personal trainer. 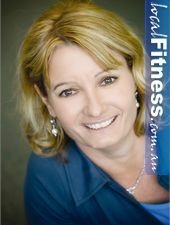 Catherine has been involved in the fitness/ sports industry for over five years. She has had a diverse employment history which makes her very versatile and keen to give anything a go. Catherine spent five years in the Army travelling overseas to Bougainville and East Timor. She was discharged in 2000 and she decided to study horticulture as she liked working outdoors and keeping active. Catherine worked as a grounds person at a Zoo for a year and although it kept her active she joined Fernwood gym. She enjoyed training and getting fit after being overweight for years. Going to the gym made her feel good about herself which made her realise that this was a career that she would like to pursue. 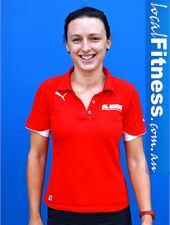 Catherine completed her studies in Certificate III and IV at the Australian Institute of Fitness while working. Catherine is happily employed at Fernwood Petrie where she was once a member. Whilst working she has also become a Body Combat and Body Attack Instructor. Her job gives her a lot of job satisfaction and enjoyment which is why Catherine knows that this will definitely be the area she will work for many many more years. My training style focuses on a variety of areas in order to meet the needs of my clients. I expect my clients to work to their full potential, but I also adapt the program to suit each individual. As I have a lot of experience with boot camp and small group training it allows me to test the boundaries of how females work and train outdoors in different environments.